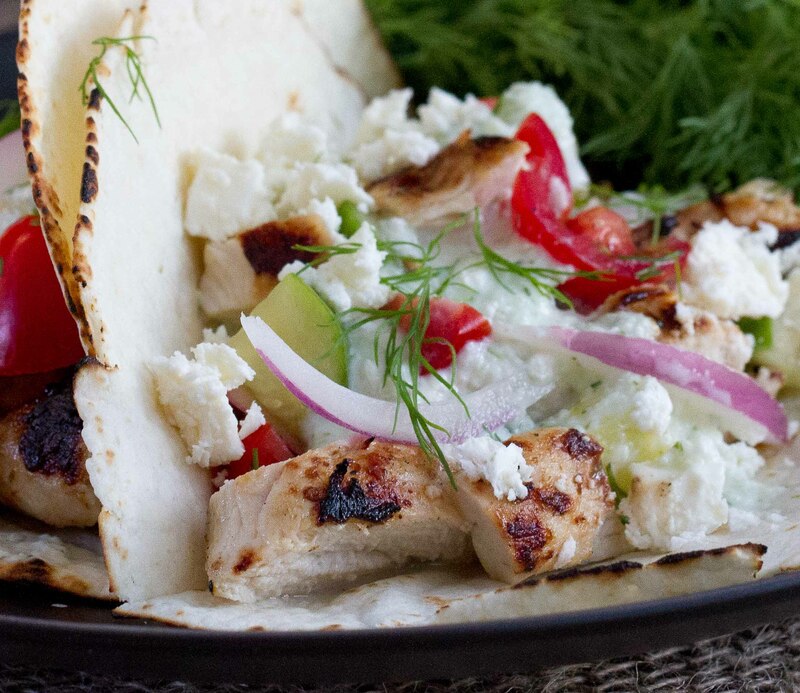 I love anything with greek flavors and these Greek Chicken Tacos with a cucumber tomato salad, Tzatziki sauce and crumbled feta cheese suits me perfectly. Have you ever had one of those weeks where everything you cook seems to be just a bit off? Well, that was my week last week. I made a recipe for Arroz Con Pollo that a friend passed along to me. While it was tasty and we certainly enjoyed eating it, I have a couple ideas to tweak it a bit before putting it up here on the blog. Then I tried my hand at a Gumbo, and again, good enough to enjoy eating but not good enough to blog about. 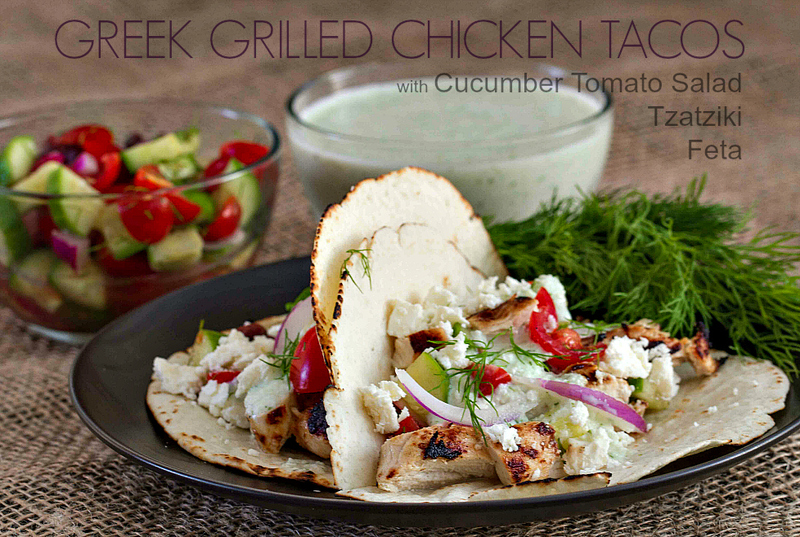 Luckily, I did have blog worthy success with these Greek Chicken Tacos I made last week. They were delicious and received thumbs up from both my husband and my son who is home visiting. This is such a simple recipe to throw together. First, I marinated a couple chicken breasts in some bottled greek salad dressing I had in my refrigerator, grilled them on the BBQ, then sliced the meat into strips. If you don’t have time to marinate the chicken, just season it with some greek seasonings (I love Cavender’s All Purpose Greek Seasoning) and grill. I combined some cucumber, grape tomatoes, red onion and dill with a little red wine vinegar to top the chicken tacos and finished it with some Tzatziki sauce and feta cheese. That was it…so simple, yet so yummy. All the greek flavors I love. As a side note: We tried wrapping this up in a pita instead of the flour tortilla but thought it was just a bit too much bread. We all preferred the tortilla. You can use store bought Tzatziki sauce if you’d like but I made this excellent recipe from Kalyn’s Kitchen. Put a couple chicken breasts in ziploc bag and pour in some salad dressing and let hang out and marinate. If you don't have time to let it marinate a bit, then just season breasts with Greek seasonings (try Cavenders All Purpose Greek Seasoning). Cut tomatoes in half or quarters. Peel and seed cucumber (if desired) and dice in chunks equal size as the tomatoes. Dice or slice red onion. Combine in bowl with some red wine vinegar (about ¼ c.), dill, salt & pepper to taste. Grill chicken on the BBQ, then slice. Heat tortilla, fill with some chicken, tomato/cucumber mixture, add a bit of tzatziki sauce and feta to taste. WOW…these look AMAZING!! So healthy and fresh but filled with flavor – the perfect taco!! Love the idea of Greek flavors in a taco. This is one fantastic meal. I want this for lunch! I love all the Greek flavors! 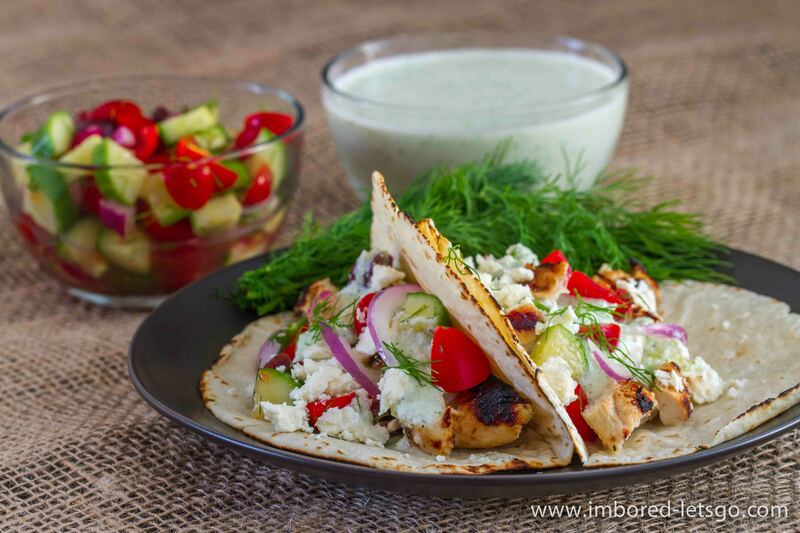 I absolutely love Greek flavors too, these tacos sound amazing, especially with the homemade Tzatziki sauce, yum!